Oscar season is in full swing and Housecall is here to celebrate some of the biggest stars nominated this year! Voting is now open for RISMedia's 4th Annual Academy Awards of Real Estate, which bestows the "Academy Award for Best Real Estate Client" upon one of this year's nominees—selected by you, this country’s best and brightest real estate professionals! Step 1: Like Housecall on Facebook. 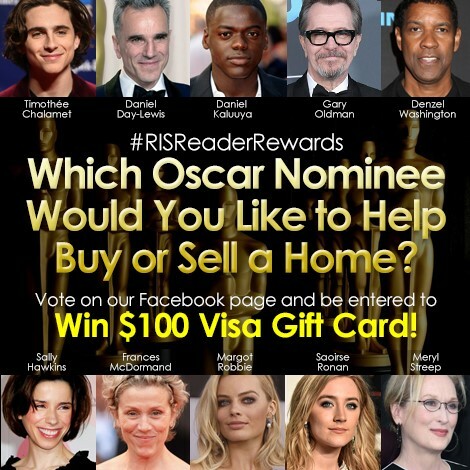 Step 2: Comment on this Facebook post with your vote for the Academy Award nominee you'd most want to help buy or sell a home. This post will be uploaded daily from now until the night of the Academy Awards and all participants will be entered for a chance to win $100! The winner will be chosen on March 5, the day after the ceremonies.